Miami, FL – The Lunch Box Gallery, in conjunction with contemporary art webzine from Spain, Area Zinc, are pleased to announce the new exhibition Fictional Eyes: The Dreams of Reason, showcasing the photographs of 8 artists who have been previously published in Area Zinc. 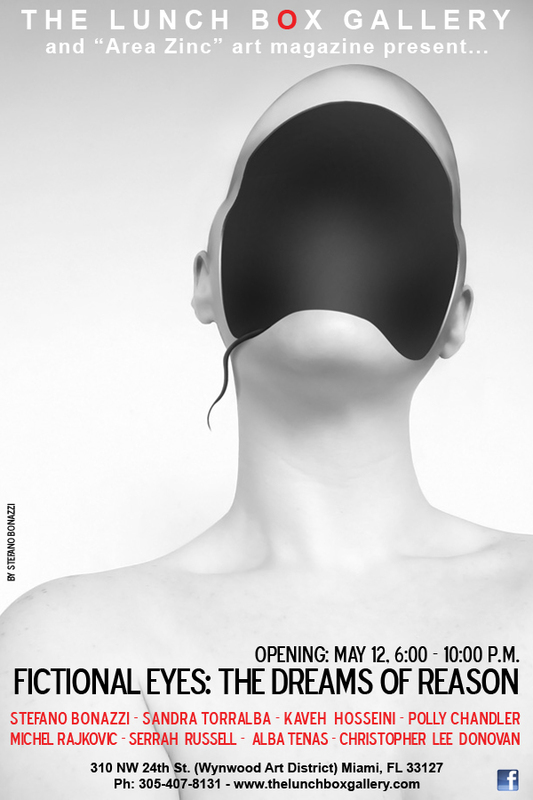 The opening reception is on May 12th, 2012 from 6:00pm to 10:00pm at 310 NW. 24th St. Miami, FL 33127. After a rigorous selection process, a body of works have been chosen that convey the idea of photography as an exercise for the imagination. All the pieces in this show reveal fictional situations, scenarios, objects and even narratives that defy not only the way we see and associate the elements that surround us, but as well challenge the limits of photography as an art form. The artworks confront the traditional idea that a photograph reflects reality, and they also deal with the diversity of outside influences that photographers have incorporated into their images when utilizing other methods of creation and techniques that weren’t necessarily there in the original take. The use of technology, digital manipulation, 3D design, illustration, collage, graphics tablet, among many others, indeed transform the image to become “something else”, taking the shape of oneiric expressions and illusions that unleash conceptual and personal imaginations. Nevertheless, even though many of the images reveal nonexistent places, forms and circumstances, they all depart from elements of real life taken with a camera, and at the end, they may become verisimilar to the eye of the beholder thanks to the mastery in merging all the elements together; just like a dream that feels real when dreaming it. Pre-conceived techniques during the taking of the photograph as well as in post-production, become the set for the visual trap, making the impossible, possible. Awe, curiosity, open conclusions and unlimited meanings arise from the sometimes unconnected imagery that we observe, stimulating the individual appropriation of the photograph by giving the connotation each viewer wants to assign. Here, concept and technique together omit the laws of reason, entering into the dreams of those who create with fictional eyes. Photographers participating in the show include Sandra Torralba (Spain), Stefano Bonazzi (Italy), Christopher Lee Donovan (USA), Michel Rajkovic (France), Serrah Russell (USA), Kaveh Hosseini (Germany), Polly Chandler (USA), Alba Tenas (Spain). Fictional Eyes: The Dreams of Reason will be opened to the public on Saturday, May 12th from 6:00pm during the popular Gallery Walks, at 310 NW 24th. St. Miami, FL 33127 (Wynwood Art District). Nevertheless, the gallery will be open that same day since 1:00pm.